For the earlier incarnation with the same name, established in 1867, see Office of Education. The United States Department of Education (ED or DoED), also referred to as the ED for (the) Education Department, is a Cabinet-level department of the United States government. 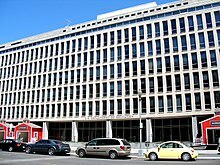 It began operating on May 4, 1980, having been created after the Department of Health, Education, and Welfare was split into the Department of Education and the Department of Health and Human Services by the Department of Education Organization Act, which President Jimmy Carter signed into law on October 17, 1979. The Department of Education is administered by the United States Secretary of Education. It has under 4,000 employees (2018) and an annual budget of $68 billion (2016). The 2019 Budget also supports $129.8 billion in new postsecondary grants, loans, and work-study assistance to help an estimated 11.5 million students and their families pay for college. Its official abbreviation is "ED" ("DOE" refers to the United States Department of Energy) and is also often abbreviated informally as "DoEd". The primary functions of the Department of Education are to "establish policy for, administer and coordinate most federal assistance to education, collect data on US schools, and to enforce federal educational laws regarding privacy and civil rights." The Department of Education does not establish schools or colleges. Unlike the systems of most other countries, education in the United States is highly decentralized, and the federal government and Department of Education are not heavily involved in determining curricula or educational standards (with the exception of the No Child Left Behind Act). This has been left to state and local school districts. The quality of educational institutions and their degrees is maintained through an informal private process known as accreditation, over which the Department of Education has no direct public jurisdictional control. The Department of Education is a member of the United States Interagency Council on Homelessness, and works with federal partners to ensure proper education for homeless and runaway youth in the United States. Opposition to the Department of Education mainly stems from conservatives, who see the department as an undermining of states rights, and libertarians who believe it results in a state-imposed leveling towards the bottom and low value for taxpayers' money. The U.S. Department of Education oversees the nation's education system. The Department sets uniform rules and standards which are applied nationwide. “Since the Department of Education (Education) began operations in fiscal year 1980, its mission has included promoting student achievement and ensuring equal access to educational opportunity. To do so, Education partners with state and local governments, which provide most of the resources to school districts for K-12 programs". Civil Rights and Equal Opportunity is one of the most forefront issues that is discussed about within the U.S. Department of Education’s four walls. The goal of this agency is to make sure that every student in primary and secondary education has the tools that they need to succeed. Not all of their ideas always work out in the best favor of the students. Throughout recent history, the educational system has not always been focused on furthering the development of all students (in regards to race and gender). However, coming out of the 20th century this ideal has been turned around and many new legislations have been put in place to break down these invisible walls that were surrounding the people who were affected by this hindrance. “The U.S., like other countries in the 21st century, is increasingly operating in an interconnected world. New structures require that teachers and our next generations of students prepare and expand ideas about their responsibilities as citizens". For 2006, the ED discretionary budget was $56 billion and the mandatory budget contained $23 billion. In 2009 it received additional ARRA funding of $102 billion. As of 2011, the discretionary budget is $70 billion. A previous Department of Education was created in 1867 but was soon demoted to an Office in 1868. As an agency not represented in the president's cabinet, it quickly became a relatively minor bureau in the Department of the Interior. In 1939, the bureau was transferred to the Federal Security Agency, where it was renamed the Office of Education. In 1953, the Federal Security Agency was upgraded to cabinet-level status as the Department of Health, Education, and Welfare. In 1979, President Carter advocated for creating a cabinet-level Department of Education. Carter's plan was to transfer most of the Department of Health, Education, and Welfare's education-related functions to the Department of Education. Carter also planned to transfer the education-related functions of the departments of Defense, Justice, Housing and Urban Development, and Agriculture, as well as a few other federal entities. Among the federal education-related programs that were not proposed to be transferred were Headstart, the Department of Agriculture's school lunch and nutrition programs, the Department of the Interior's Native Americans' education programs, and the Department of Labor's education and training programs. Upgrading Education to cabinet level status in 1979 was opposed by many in the Republican Party, who saw the department as unconstitutional, arguing that the Constitution doesn't mention education, and deemed it an unnecessary and illegal federal bureaucratic intrusion into local affairs. However, many see the department as constitutional under the Commerce Clause, and that the funding role of the Department is constitutional under the Taxing and Spending Clause. The National Education Association supported the bill, while the American Federation of Teachers opposed it. As of 1979, the Office of Education had 3,000 employees and an annual budget of $12 billion. Congress appropriated to the Department of Education an annual budget of $14 billion and 17,000 employees when establishing the Department of Education. During the 1980 presidential campaign, Gov. Reagan called for the total elimination of the U.S. Department of Education, severe curtailment of bilingual education, and massive cutbacks in the federal role in education. Once in office, President Reagan significantly reduced its budget. The Republican Party platform of 1980 called for the elimination of the Department of Education created under Carter and President Ronald Reagan promised during the 1980 presidential election to eliminate it as a cabinet post, but he was not able to do so with a Democratic House of Representatives. In the 1982 State of the Union Address, he pledged: "The budget plan I submit to you on Feb. 8 will realize major savings by dismantling the Department of Education." By 1984 the GOP had dropped the call for elimination from its platform, and with the election of President George H. W. Bush in 1988, the Republican position evolved in almost lockstep with that of the Democrats, with Goals 2000 a virtual joint effort. After the Newt Gingrich-led "revolution" in 1994 had taken control of both Houses of Congress, federal control of and spending on education soared. That trend continued unabated despite the fact that the Republican Party made abolition of the Department a cornerstone of 1996 platform and campaign promises, calling it an inappropriate federal intrusion into local, state, and family affairs. The GOP platform read: "The Federal government has no constitutional authority to be involved in school curricula or to control jobs in the market place. This is why we will abolish the Department of Education, end federal meddling in our schools, and promote family choice at all levels of learning." In 2000, the Republican Liberty Caucus passed a resolution to abolish the Department of Education. Abolition of the organization was not pursued under the George W. Bush administration, which made reform of federal education a key priority of the President's first term. In 2008 and 2012, presidential candidate Ron Paul campaigned in part on an opposition to the Department. Under President George W. Bush, the Department primarily focused on elementary and secondary education, expanding its reach through the No Child Left Behind Act. The Department's budget increased by $14 billion between 2002 and 2004, from $46 billion to $60 billion. On March 23, 2007, President George W. Bush signed into law H.R. 584, which designates the ED Headquarters building as the Lyndon B. Johnson Department of Education Building. In the time after George W. Bush’s presidency and towards the end of President Barack Obama’s presidency, there was an extremely noticeable problem within the education system that was excluding many children from receiving the striving opportunities that they should have been given throughout their schooling careers. So, In December 2015 President Barack Obama had instituted the Every Student Succeeds Act, which reauthorized the Elementary Secondary Education Act. “In December 2015, the Every Student Succeeds Act (ESSA) was signed into law, reauthorizing the Elementary and Secondary Education Act (ESEA) and replacing the No Child Left Behind Act (NCLB). ESEA, the federal law that authorizes federal funding for K-12 schools, represents the nation’s commitment to equal educational opportunity for all students and has influenced the education of millions of children." On February 7, 2017, Representative Thomas Massie (R-KY) introduced H.R. 899, a bill to abolish the department. Massie's bill, which is one sentence long, states, "The Department of Education shall terminate on December 31, 2018." ^ a b Stratford, Michael (January 22, 2018). "Education Department goes into shutdown mode". Politico. Retrieved January 25, 2018. ^ a b "Overview and Mission Statement - U.S. Department of Education". www2.ed.gov. ^ "Department of Education Organization Act, 1979". wordpress.com. 15 April 2011. ^ U.S. Secretary of Education (14 February 2018). "ED FY2019 Budget" (PDF). ed.gov. ^ What We Do. ED.gov. Retrieved on 2013-07-17. ^ "An Overview of the U.S. Department of Education, p. 2". United States Department of Education. Retrieved August 25, 2012. ^ "Department of Education | Member Agency | United States Interagency Council on Homelessness (USICH)". Usich.gov. Retrieved 2012-08-25. ^ "Laissez-faire-learning". 2012-06-25. Retrieved 2012-06-28. ^ Hubbard, Janie; Swain, Holly Hilboldt (July 2017). "Using the U.S. Civil Rights Movement to explore social justice education with K-6 pre-service teachers". The Journal of Social Studies Research. 41 (3): 217–233. doi:10.1016/j.jssr.2016.09.002. ISSN 0885-985X. ^ "ED History" (PDF). U.S. Department of Education. 2015-09-25. Retrieved 2017-02-28. ^ a b "Overview". U.S. Department of Education Budget Office. 2011-02-12. Retrieved 2011-03-27. ^ "Wayback Machine" (PDF). archive.org. 13 January 2017. ^ "Act to Establish a Federal Department of Education, 1867". wordpress.com. 19 February 2011. ^ Chap. CLVIII. 14 Stat. 434 from "A Century of Lawmaking for a New Nation: U. S. Congressional Documents and Debates, 1774–1875". Library of Congress, Law Library of Congress. Retrieved April 25, 2012. ^ a b c d "Department of Education Outlined". Pittsburgh Post-Gazette, via Google News. Associated Press. February 9, 1979. ^ "House Narrowly Passes Department of Education Bill". Spokane, Washington: The Spokesman-Review, via Google News. The New York Times. July 12, 1979. ^ Hechinger, Fred M (September 3, 1979). "Federal Education Branch Is Foundering, Leaderless". Lexington, North Carolina: The Dispatch, via Google News. New York Times News Service. ^ "Education Department Created". The Palm Beach Post, via Google News. United Press International. October 18, 1979. 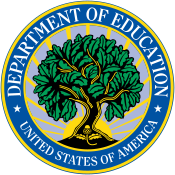 ^ "Online Backgrounders: The Department of Education". PBS. Fall 1996. Retrieved 2005-07-26. ^ a b c d e Veronique de Rugy and Marie Gryphon (2004-02-11). "Elimination Lost: What happened to abolishing the Department of Education?". Cato Institute. Retrieved February 15, 2017. This article originally appeared in National Review Online on February 11, 2004. ^ "Education". 2007. Retrieved 2007-09-14. ^ Stossel, John (2007-12-10). "Ron Paul Unplugged". ABC News. Retrieved 2008-01-30. 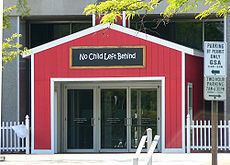 ^ "Paige Fields Team to Leave No Child Behind". United States Department of Education. April 11, 2002. Archived from the original on September 24, 2003. ^ Young, Michelle D.; Winn, Kathleen M.; Reedy, Marcy A. (2017-10-13). "The Every Student Succeeds Act: Strengthening the Focus on Educational Leadership". Educational Administration Quarterly. 53 (5): 705–726. doi:10.1177/0013161x17735871. ISSN 0013-161X. ^ "President Bush Signs H.R. 584, Designates U.S. Department of Education as the Lyndon Baines Johnson Federal Building". Georgewbush-whitehouse.archives.gov. 2007-03-23. Retrieved 2012-08-25. ^ "Rep. Massie Introduces Bill to Abolish Federal Department of Education". house.gov. 7 February 2017. Wikimedia Commons has media related to United States Department of Education. ERIC Digests – Informational digests on educational topics produced by the U.S. Department of Education before 1983.